Crescent Shield is a progressive power metal band formed by Dan Delucie, originally in New Eden before branching out to form Destiny's End. For whatever reason, Destiny's End disappeared off the face of the earth in 2001 after releasing two highly touted US power metal albums. Not long after, Delucie announced his new project, Crescent Shield. "The Stars of Never Seen" is the band's second, and as of writing this, their last album. Also on board is former Onward vocalist Michael Grant (though sadly he passed away in May 2012), as well as a rhythm section of drummer Craig Anderson (Seven Witches) and bassist Melanie Sisneros (New Eden). Anyone familiar with the background of these musicians won't be surprised what is musically delivered on this disc. Though they are labeled progressive metal and power metal, this is not lightweight, keyboard-drenched prog. Instead, this is real heavy metal with a progressive edge, not unlike Fates Warning's "No Exit" or "Awaken the Guardian". That's not to say that the two bands sound anything alike, but the intensity and the grandiose, epic, progressive tendencies are the same. The album starts off with the slow, melodic, and very epic "Under Cover Of Shadows" and quickly builds with the majority of the album being driven by heavy, galloping guitars and even ascending to speed metal terrain with the short "My Anger". As with most progressive bands, Crescent have those stop on a dime tempo changes, technically proficient lead work, as well as the odd clean guitar parts thrown right into the middle of a song. If I'm not mistaken I thought I even heard a mandolin in the middle of one song. The vocals on "The Stars of Never Seen" have that epic quality required for power metal, but with a much lower register than what would be expected. The deeper clean signing gives the music a darker, gothic sound. The track "The Bellman" even features a few lines of slightly growled vocals, but they never really stray any further into more extreme metal forms. "The Stars of Never Seen" may very well be the last album from Crescent Shield. 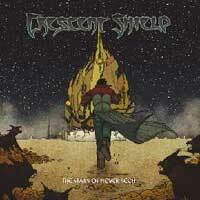 It is a solid power metal album with plenty of epic and progressive tendencies. Disc 2 of this package features a full concert of the band recorded at Keep It True Festival in Germany. The track listing is mostly made up of songs from the band's debut with one song, "Lifespan" coming from "The Stars of Never Seen".